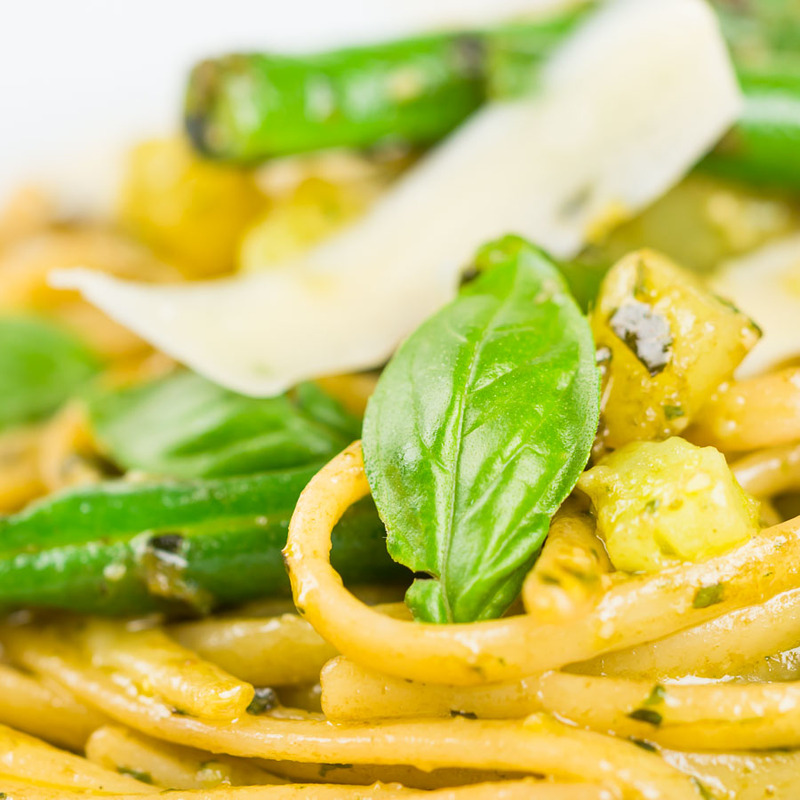 Pesto Pasta with potatoes may sound odd but it is a really popular dish in the Ligurian region of Italy, a place where pesto is very much king! 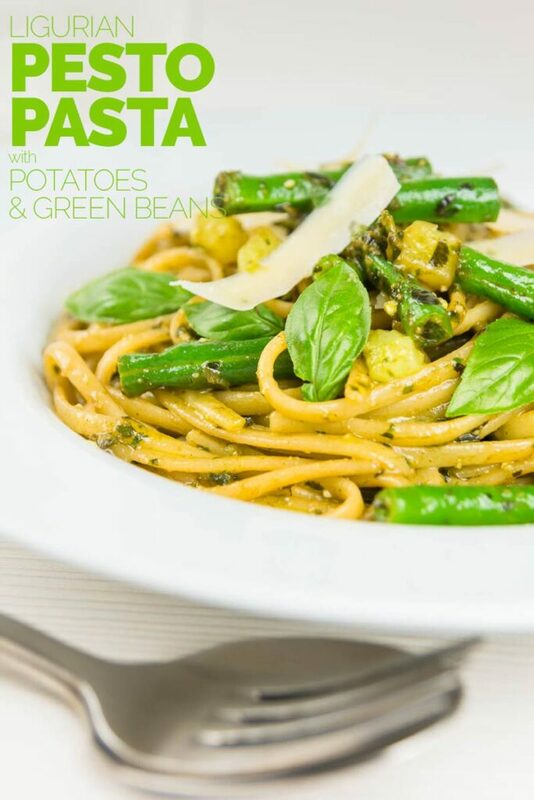 Pesto Pasta with Potatoes and Green Beans. The pesto pasta recipe is a surprising and relatively new addition to my pasta recipes. Potatoes and pasta may seem like a bit of an odd combination, but apperently it is a very popular recipe in the Ligurian region of Italy. I saw it floating around in a couple of places and new that I would have to give it a go. This recipe for me this summer has been a full on garden recipe, so really very frugal. I usually make it with fresh homemade pasta, but I have changed that up here to dried linguini. That means the pesto, green beans, potatoes and eggs for the pasta all come from my garden. It truly is a magical way of cooking! You can, of course, make this with your favourite jar of pesto, but making your pesto is so very simple! 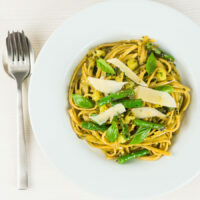 In many ways, this pesto pasta recipe is very similar to my pesto spaghetti with goats cheese recipe. Although this one is probably a little closer to an ‘authentic Italian’ recipe. Although this recipe is apparently usually served with shorter twists of pasta called Trofie, hey shoot me for changing this up! On the note of authenticity and Italian recipes, I had a fun and enlightning conversation with a few food blogger this week past. It all started off with a really rather unpleasant comment on a friends website, yes, we share this stuff! Regular readers will know I have no time for the authenticity police! The minute that you think you have the ‘right’ to tell me what I can call or add to a recipe is the minute you will be told to leave! However, that does not mean that I am incapable of holding a conversation on the matter. I love nothing more than discussing food, even with people that disagree with me! Anyway as an outfall of that conversation a friend shared this link with me. It was a great read although as a Brit, I definitely know and cook recipes from Mrs Beatons book of household management! And no that does not make me old, really really old! It probably does mark me out as a minority though. It is probably the best short breakdown as to how Italians feel about food I have read. Not that it makes a difference, of course, my pea pasta carbonara contains sour cream to counteract the sweetness of the peas. I touched on the simplicity of making homemade pesto earlier before I got distracted. It really is very much worthwhile making your own pesto it takes minutes and the aroma of fresh basil is magical. I used to struggle with growing basil, yep I grow all sorts of stuff but Basil thwarted me for years. It would seem I was being too precious with it, I would try and leave it alone until it formed a full plant. Well, a couple of years ago I had a small plant and practically decimated it when it was young… By ‘eck did it grow back with a passion. Seemingly the more you pick the stronger the plant grows! So grab a pot and stick it outside and give it a go and treat it mean… Water it regularly but not a lot in terms of volume and have as much fresh homemade basil as you can get your hands on. Whilst the water is coming to the boil toast your pine nuts in a dry pan for a couple of minutes. When toasted place in a blender with the basil, olive oil, and garlic then blend to a rough paste. Add this paste to the parmesan cheese, stir then set aside. Peel and cut your potatoes into a 5mm dice. Chop your green beans into 2-2.5cm lengths. By now your water should be boiling throw in the potatoes and cook for 2 minutes. Then add the linguini to the pan and cook as per the instructions, this should be between 9 and 11 minutes. 2 minutes before the pasta is done throw in the green beans. Drain reserving a little of the cooking liquid, return to the pan and stir in the pesto adding as much liquid as required to make a sauce. 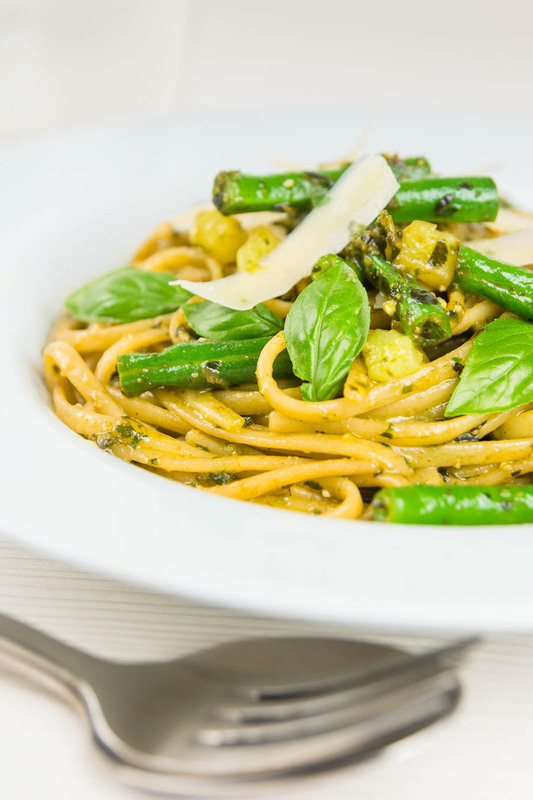 Serve with parmesan shavings and more basil leaves. I can’t wait to try this recipe for something different. I make pesto quite often and started to freeze it for later as well as keep a jar covered in oil in the fridge for another meal the following week since we grow it since it seems we have either tons of it growing on hardly any so am always thinking what I can add with it instead having it by itself or say chicken. Certainly not of my doing, it is apparently a popular dish in Liguria which is the home of great pesto, it sounded odd to me at first but tastes fantastic. wow never thought of mixing potatoes and pasta. I do love pesto! So yum! I hadn’t either until I read about the recipe from Liguria and I loved it, now it is a firm favourite on our table. This looks so simple and delicious, i love pesto, i could eat with anything! Same here and it is so simple to make too! 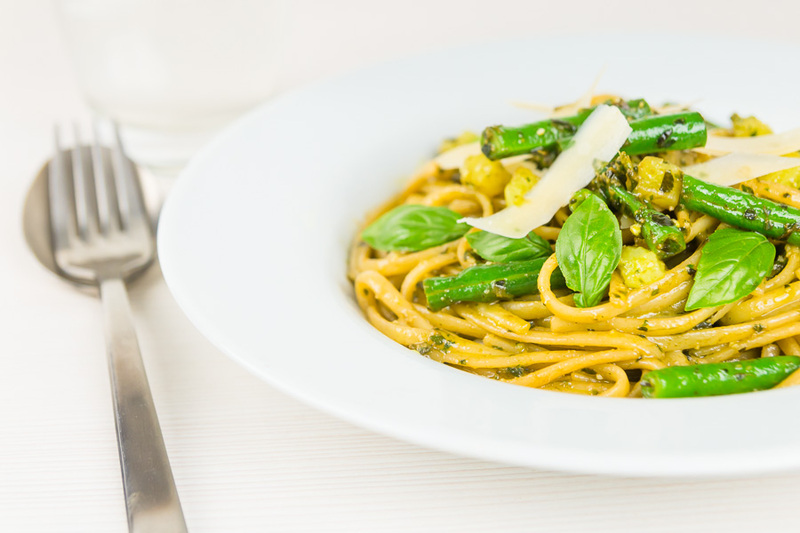 Pesto pasta is always our go to for a quick and easy meal. I like the addition of green beans!